Almost every organization on the planet uses interviews as a means of assessment during the hiring process. And understandably so. After all, you want to see the person you might be hiring up close. Did you know that only a small percentage uses pre-employment assessments in the process? Which is funny because the predictive properties of a carefully crafted assessment flow outrank that of just an interview by a huge margin. Imagine what happens when you combine the two. Your hiring stats will go through the roof. In a positive manner that is. And that’s not all. If you do it right, the use of assessments during your hiring process can have a positive impact on your candidate experience as well – if you do it right that is. Believe it or not, but many candidates just love to show off their skills. Throw a Realistic Job Preview in the mix and you’re all set! Judgment tests goes a long way. Luckily as of late, more and more organizations start to move towards this combined approach of candidate assessment. Why now? Because of rapid technological innovation. We’ve spoken about this subject before, and regular blog readers already know, but the rise of cloud-based computing, data analytics, and AI has drastically changed the recruitment game. To help you get a grasp of what this exactly means for your business, I’ve written a guide on pre-employment assessments. This guide! Because of the length of this piece, I’ve broken it down into 5 chapters which you can find below. Click on a link to zap straight to a chapter, or read if from top to bottom. Your call! When do you need pre-employment assessments? 1. What are pre-employment assessments? Pre-employment assessments or Pre-hire assessments are tests and tools used to compare the critical competencies of your candidates in order to find the best match for your job and organization. They come in many shapes and sizes, ranging from personality and skill assessments to culture fit, cognitive ability assessments and beyond. There are tests on paper, digital tests, real-life tests (think simulator trials for the air force) and we’re not far from VR-Assessments either I reckon. So there’s enough choice to satisfy any assessment loving recruitment/HR department out there. The flipside of this crazy wide variety of pre-hire assessments is that many people get lost when looking for a way to assess candidates. Sure, you can decide to use a personality, cognitive ability and aptitude test to sketch a detailed profile of a particular candidate and what he or she is capable of. And sure, it will assisst you in your hiring decisions. But before doing so please ask yourself – is that really necessary? After all, implementing a variety of assessments directly impacts candidate experience. Sometimes in a bad way, sometimes in a good way – that, in the end is up to you. So yeah, there’s a little more to it than lining up a random battery of tests, but not to worry! In the next paragraph, we’ll provide you with a framework to determine whether or not assessments might be beneficial to your organization (spoiler: they probably are), how to determine what you should measure and how to implement an efficient and above all success predicting hiring flow. To make things a bit more fun, I’ve added a fictional example as well. Fictional, but based on experiences we’ve had with our clients here at Harver (we are a pre-employment assessment software vendor after all). Alright, onto the next level! 2. When do you need pre-employment assessments? Now, this is where things get interesting. Pre-employment assessments can benefit almost any business. But you’ll get the most value out of them if you actually know where the challenges in your current selection process lie and what it is you want to fix. Efficiency in preselection mostly means spending less time on tedious tasks and decreasing the overall time it takes to hire someone as well as the costs involved. As a rule of thumb, 20% of all candidates are and never will be, a fit for your organization. What you want to do with assessments is weed out this bottom 20% so you can spend your time on, at least, the 80% that have a chance of becoming a top performer. Metrics to measure the efficiency part are predominantly Time to Hire and the number of applicants that finish your hiring flow. This data is typically displayed in your ATS and/or HRIS, but can be tracked manually as well (which is not very efficient though.). Quality is a variable metric but is defined by many organizations as the number of applicants that get hired and eventually stay at the company for at least a predetermined time. Some organizations throw in performance metrics as well. And these can be different for every role. Think the number of deals closed for salespeople or the number of support tickets handled for customer service employees. For more in-depth information on the subject, check out the article we did on the Quality of Hire metric. Assessments, of course, measure if someone is or isn’t a right fit for the job and your company. When done right, implementing assessments will increase your quality of hire significantly and, in turn, decrease employee turnover. Employee turnover is measured differently in every organization – some think leaving after 6 months is early, while others think a year is early. But in the end, everybody wants to decrease the number of people leaving prematurely. For obvious reasons. Now, this is a tricky one. Tricky as in, it’s a balancing act once more. If done right, pre-employment assessments have a significant positive impact on the overall candidate experience. But when done wrong, the process can have a negative impact as well. What do we mean by right and wrong? Well first up, your assessments need to look slick and feel fresh. The days of boring endless clicking through grey screens should be over by now. Use video, use images, tell a story. Utilize a great looking design and language that resonates with your applicants. Make sure you provide them with a taste of what working at your organization is like. This manages a candidate’s expectations and creates awareness on the reality of working at your company. They’ll love you for it. Zappos did it and ended up with 97% of applicants liking their new hiring process. Side note: they built it using Harver! Second, your assessments should work on a base of reciprocity. Meaning you should give a little, and then ask a little. Give a little, ask a little. After your applicants made a personality test, give them the results. After a situational judgment game, give (show) them a video about life at your office, and so on. This way you show your applicants that you value them. That effort put in, is being repaid and that your application process is a two-way street. Just as it should be. Oh, and don’t forget to share scores and feedback afterwards. They’ll love you for it. With the explosion of “Big Data,” all program areas within an organization are collecting, cleaning, analyzing and visualizing data to make business decisions. With this in mind, it is imperative that HR organizations bring value to the overall strategy by providing the people data. As we know, people are the main differentiators in organizations today and assessments are the start of the journey to predict and engage high performing employees. The more you focus on the integration of your assessment process within your overall data framework and have feedback loops to continually improve your assessments, the better you will be at selecting the right people for your organization. Face Validity – Meaning an assessment appears effective in the way it states to be. If you want to measure a candidate’s personality, questions regarding behavioral tendencies should be asked. This can be spotted at a glance, hence ‘face validity’. Although face validity is seen as ‘the weakest form of validity’ it does help industry experts to quickly assess whether or not research – or an assessment – has a chance of being valid. Construct Validity – Does the assessment actually measure what it says it does. In short, does a personality test actually measure personality? Construct validity is determined by comparing the outcome of a test, with already validated tests in the same segment. Predictive Validity – Does the assessment predict what it should predict. In the case of the personality example again: does it predict culture fit and job performance? Predictive validity is established by testing a group of candidates and then comparing their results with their performance in the future. Now that we know the domains in which pre-employment assessments can help, it’s time for the next step. Because implementing assessments is quite the balancing act. Think about it, if you want to improve quality of hire by adding 10 assessments to your selection process, you’ll probably end up with a high drop-off rate and a lower candidate satisfaction score. If you want to improve efficiency and speed up the process, you’ll have to decide on only one or two assessments but hand in a little on the quality part. And although it’s a balancing act, there are steps you can take to make the process as smooth as possible. It all starts with determining what to measure, followed by a flexible implementation, keeping the end goal in mind and continuous improvement. Before implementing anything, you have to determine what success means in your organization. Is it hitting targets or are you trying to build a culture of empathy? Are you looking for skills or is motivation a bigger factor? Think about it, weigh each of the ‘success variables’ and determine which is most important. This will help you in picking the right assessments and working out the quality/candidate experience equation later. Also, not everything you want to measure needs to be measured with an assessment. If you’re looking for a sales rep for example, and you want to know if this person is quick-witted and well-spoken, this is best assessed in an interview. If you want to know more about this person’s personality, assess with a personality test and verify the test in an interview. In the end, it’s this combination of assessments and an interview that is priceless. Keep in mind here that in the end, pre-employment assessments work as decision support. Many organizations these days use assessments as a first hurdle for candidates, but this is not the right approach. The data should inform the interview, not guide it. In the end, you’ll never have enough information to make a decision on assessment data alone. But the more data points you have, the more confident you can be in your decision-making. Another thing to keep in mind is that wherever you get your assessments and no matter how you implement them, they should be flexible. Although ‘agile recruitment’ was a trending buzzword in 2016 and 2017, it is still very much applicable today. Make sure you partner up with a vendor that can switch up, add and remove assessments from your process on a whim. Or better yet, use recruitment software where you can do it yourself. Especially at the beginning of your assessment journey, this is crucial. After all, you have to test what works. Maybe it turns out that a personality test isn’t predictive for success in your case and that you need more situational judgment games. It would be a shame if you wouldn’t have the possibility to change stuff quickly. The only problem here is that traditional assessments rarely give you this freedom. Luckily, there are more and more companies out there that offer pre-employment assessment technology that you can customize, switch up and brand to your liking. We’ve built something we call a multi-assessment platform. Harver users can build entire pre-employment assessment flows from scratch choosing from a wide variety of assessments from the Harver module store (also called: assessment marketplace). You can select the tests you like, slap your logo on it, give them your colors and add videos, images, and questions. Once your assessment flow is complete, connect it to your vacancy et voila! You have just set-up a custom hiring flow. hiring sequence. Done. You now have a personality test in your hiring flow. It doesn’t work? Take it out again. Now that’s what we like to call agile recruitment. 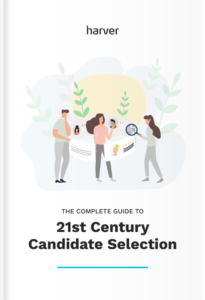 Now your candidates get a fun, branded application experience while algorithms calculate a matching score between the candidate and your organization. This matching score works as decision support for you and your team. The system is fully customizable at any given time. Do you notice a shortage of candidates that finish the experience? Try shortening it. Do you notice you have too many? Try and make it a little longer. Add an extra assessment. See what works. Test and refine. In the end, you have to keep in mind that assessment data works as decision support. Assessments, data, AI and automation will not replace recruiters. Definitely not. New techniques and technology should be used as decision support, helping recruiters in making the right decisions more efficiently. Now, with our new found knowledge on assessments and software, let’s look at a (simplified) example. Again, the story is fictional but it is something we’ve seen many times with organizations we work with. Sarah is Talent Acquisition director at a scale up that wants to hire 60 sales people and 30 customer support agents this year. The hiring process right now consists of a phone interview, a face-to-face interview, a case, and a final interview. Sarah has been struggling with a very long Time to Hire and a not so sustainable Cost per Hire. Also, many bad hires happen throughout the year, mostly due to a misalignment in culture. Now that the company wants to scale, Sarah is under pressure to change things. She decides to start working with validated assessments to improve on these domains. Together with the executive team, it is decided that Culture Fit, Motivation and Personality are important for everyone – we can call these ‘the basics’. But of course, sales and support agents need different skills, abilities and knowledge levels to be successful in their jobs. So the assessment flows for these two jobs differ. Using pre-employment assessment software Sarah builds two hiring flows. One for sales, one for customer support. For sales, she chooses to implement culture fit and personality tests to establish the basics. She adds tests to determine cognitive ability and multitasking and adds videos to show candidates what it’s like to work at her organization. Runtime of the flow – 30 minutes. For customer support, she implements culture fit and personality to establish the basics. She adds tests to determine cognitive ability, multitasking, grammar, typing and a couple of situational judgment games where candidates have to help customers. Just as with sales, she adds videos to show what life is like at her organization. Runtime of the flow – 55 minutes. After a month, the sales flow is doing its work perfectly. Time to hire has decreased by 40%, Cost per Hire by another 30% and she gets a lot of positive reactions from applicants. 83% of applicants finish the flow. Hiring the right people is a breeze. Spot on! The customer support flow is a different story. After a month it turns out that only 48% of applicants finish the flow. Time to Hire has decreased, Cost per Hire as well, but many candidates claim the process is too long and she doesn’t get enough people in. Time to switch things up. She decides to delete some of the stuff in the flow to improve the candidate experience. With the click of a button, she deletes the multitasking assessment, brings down the number of situational judgment games from 6 to 3 and decides to use a different version of the personality test. Instead of 100 questions, candidates now get 60. All this decreases the time it takes to finish the flow from 55 minutes to 35. She gives a little bit on the quality part but weighs it against the candidate experience. The results roll in and 74% of candidates finish the flow and she hasn’t heard anybody complaining about length anymore. What’s even better, the quality of the interviews hasn’t gone down significantly. Perfect! Sarah saw a flaw in the candidate experience part, assessed which assessments were less necessary and decided she could remove some. She balanced quality/candidate experience and improved the hiring flow accordingly. But the work isn’t done yet. After you’ve implemented your assessments and get positive results, the interesting part starts (I’m a data geek, forgive me). We’re living in an age of data, and deciding not to work with – and utilize data, means you’re driving blind. Especially when the competition does use data to improve their hiring process. Whatever it is, you should develop a mindset of data and continuous improvement. Try to switch up things, analyze what it does to the performance of your hiring flow, and adopt or discard the changes. Make sure you partner with an assessment provider that offers a customer success plan. Monitor key KPI’s together and let them inform you on which assessments can help identify success predicting competencies best. Identify breakdowns in your process, collect feedback. Quantitative as well as qualitative. Make sure the information you collect flows through to onboarding, training and development and performance management. Instead of a siloed approach, turn your hiring process into an integral part of the entire HR lifecycle. Integrate systems, let them talk to each other. Yes, this will require some reading, learning, and out-of-your-comfort-zone-stepping. You’ll probably have to partner up with a few tech-vendors but trust me, it will be worth it! Try it, ask around, be curious. Request a couple demos here and there, learn and see what’s possible. There we go. The basics of pre-employment assessments in a single overview. I say basics because, in the end, you can go as deep as you like. It’s a wondrous world, that’s definitely worth exploring. Especially now with technology entering the space as well. The days of single-serving boring assessments are over. And the days of candidate experience improving, time to hire decreasing and quality improving online assessment experiences are here! Look around a bit on our website to see what we mean and as always, don’t forget to subscribe to our content digest. You’ll receive articles like this, every Wednesday (subscribe below). Happy hiring and till next time!